This blog post was co-authored by Vijay Nagarajan, Senior Program Manger and Kiran Madnani, Principal PM Manager, Azure Infrastructure Management. This feature is now generally available. In addition to the Azure portal, you can invoke the Scheduled Query Rules REST API directly or from Azure CLI, PowerShell and Azure resource manager templates (read managing log alert using resource manager). Pricing is available on the Azure Monitor pricing page. Application Insights is an extensible application performance management (APM) service for web developers on multiple platforms. Customers use Application Insights to monitor live web applications, detect performance anomalies, diagnose issues and to understand usage patterns. In addition to the alerts on application health based on different metrics, you can now monitor e-log files by setting up a query to run at specified intervals and trigger alerts based on the result. For example, let’s say you deployed a new fix for a specific exception and want to make sure it doesn’t surface again. You can now setup an alert to trigger if that exception appears in your Application Insights trace file. Number of Records: Triggers alerts based on the number of records returned for query on Application Insights. For example: Want an alert every time your webapp gives a 500 response. 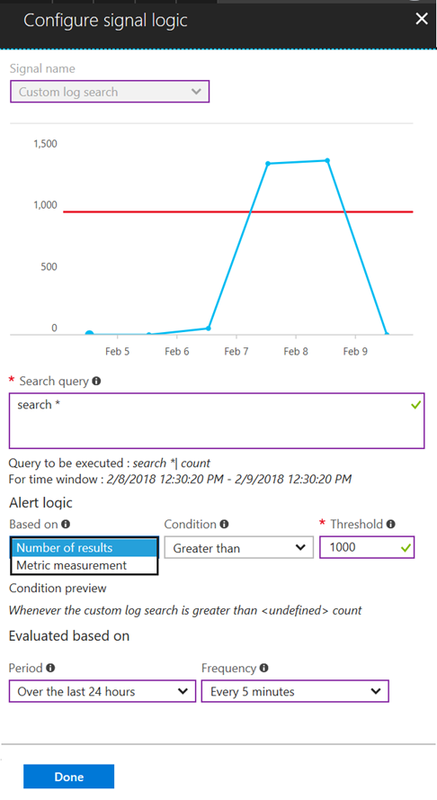 Create a log alert of type number of records and threshold set as one with query: requests | where resultCode == "500"
More details on log alerts can be found in Microsoft Azure Documentation for Log Alerts. Here is a short video to help you get started with Log Alerts for Application (preview). 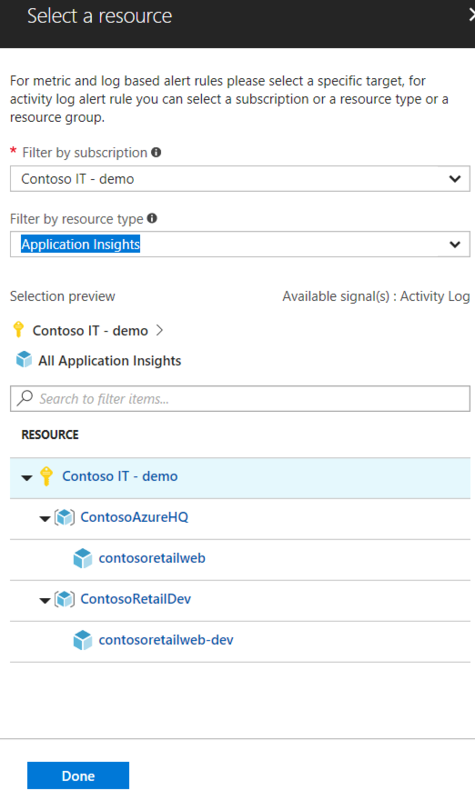 The Log Alerts for Application Insights and the new alerts experience are both in preview and will be rolling out in a scheduled manner to all regions from today. We would love to hear your feedback, email us at: azurealertsfeedback@microsoft.com.